The mathematical model to calculate RCS, reflection/emission was Russian developed... the US copied it. Before they read is paper on the concept they built small scale models and hoisted them up in front of real radar and tested them... an extremely slow and expensive way of developing stealth aircraft because they didn't know what worked and what did not without testing it. Spike management just acknowledges that radar returns are 3D and each angle in 3D creates a different return from a specific direction and angle. USSR/Russian contribution in stealth design and tecnology. How the US scavenged and benifitted from it???? Why dont you learn to google? Kh-101 is an example. It is stealth tech. Long before PAK FA. They are also developing the PAK FA with 21st century technology/materials, whereas the F-22 is a 1990s aircraft and the F-35 is stuck in a cold war colonial power mindset too. They never surpassed them. When US started to work on it Soviet union try to find weaknesses of the technology and to counter them. The fall of the Soviet union had a big impact on the research in russia in general. It's just when Putin became president that they could do some interesting things. But the theroical knowledge was almost the same if not better. Russia has very good ingineers but US has more money and can do more experiences and more projects like Sr-71, B-2, F-22,F-117, prototypes ... while Russia will do Something that it will be used by the army T-50 and not 10s of projects to test them and then select just 1. And for the air force Stealth is not the only aspect where the plane need to be good, if has an impact on the manoeuvrability they will reduce the need for stealth. They know what missiles can and cannot do, what radars can and cannot see. So they know perfectly what lvl of stealthness, weight, manoeuvability the plane needs. The su-34 is stealth from frontal direction. There is stealth and there is reduced RCS... stealth comes from blueprint design level, while reduced RCS can be applied to an existing design. Both the Tu-160 and Su-34 have had modifications to their design to reduce RCS, but neither could be called actually stealthy. The same could be said for the F-18 superhornet and the Rafale and Typhoon. GarryB wrote: There is stealth and there is reduced RCS... stealth comes from blueprint design level, while reduced RCS can be applied to an existing design. 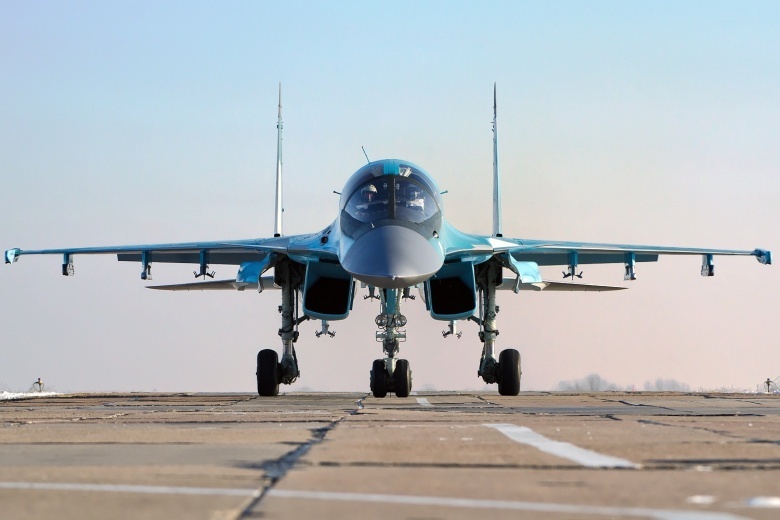 Check the frontal shape of the Su-34. 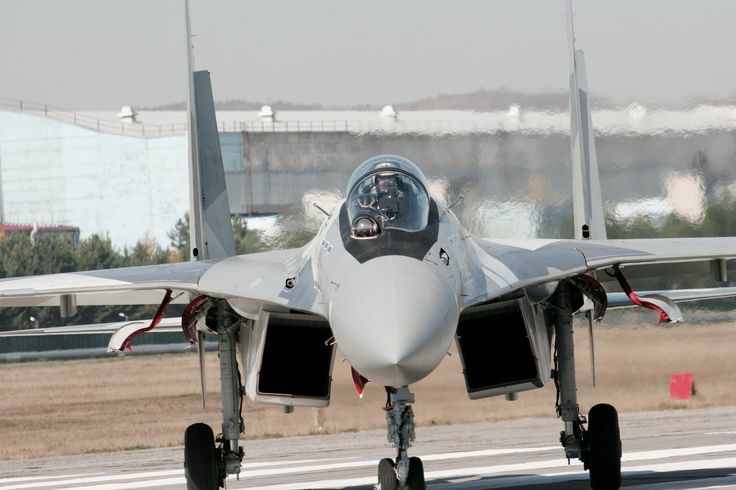 The Sukhoi designed it to have low frontal RCS. The Su-34 was designed to have low frontal RCS. It is not modified to decrease the RCS. And it's not stealth at all, neither it has low RCS. Smaller rcs than what it should have if it was a twin seat Su-27 maybe but with iron bombs on it, it has still a huge RCS. For modern radar, 20m² or 10 m² is not different. You have to to reach at least 2-3m² for a Su-27 class to achieve some results. The Su-34 was first and foremost modified to allow two crew to sit side by side with an excellent forward view. It was also designed to reduce radar return, but it is not a stealthy design. The Su-34 is low observable from the frontal direction. The pylons/wings and so on doesn't matter from that angle. All "stealth" plant has only limited reduced RCS. Typical it is the loves from front, and highest from back, and it is the low in a narrow vertical angle, say for +5/-15 degree. 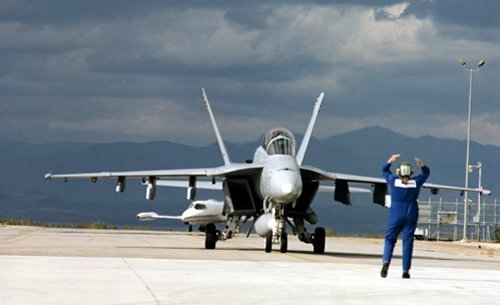 And can anyone identify a NATO aircraft apart from F-22 or F-35 that as stealth as the Su-34? Operationally it will fly very low and very fast to evade ground based radar so most radar actually detecting the aircraft will be airborne, so most views of it will be from above, but even from a slight angle to the side will make the enormous vertical tails visible... and they are not stealthy by any means. The Su-34 is a large aircraft... its RCS is not difficult to detect and is by no means stealthy. An AWACS aircraft detecting it from above and in front might think it could be a MiG-21 but they wont confuse it with a bird or insect... especially when it is travelling close to supersonic speed at low levels. The shaping is more aerodynamic than stealthy though in a sense both are valid. The only comments I have read about the aircraft using stealth is where the radar transparent nose has a sealed container with exotic gasses through which high voltages are passed to create plasma, which absorbs in all frequencies. There is a large radar antenna there so high voltage power is no problem and the nose cone area is normally empty so there would be no practical reason why they could not do that. The main problems are that when activated radar waves wont go through in either direction, which means your own radar can neither illuminate targets or scan for targets and enemy radar will not penetrate in either, so you can't use your radar to listen or to look while it is on. Of course the value of being able to hide at the flick of a switch is interesting... when no enemy radar is detected or you are hunting SEAD targets you might want to keep it off. Check the frontal shape of the Su-34 ,and the other planes. The frontal shape is huge. If it was stealthy then why don't the makers call it stealthy? Check your eyes. Su-34 from the front has a nice looking but that doesn't mean it's stealth. From the front you can see rotor blades, weapons, huge canopy, canards, two huge tailplanes, lack of stealth geometry, lack of stealth paint, maybe some basic RCS reduction in composite materials but that's Nothing compare to a rafale or a Superhornet. GarryB wrote: The frontal shape is huge. This guy believe what he wants. You can show him official top secret numbers he will not trust them. Now hee will change subject so that he doesn't argue on this because he has 0 argument. He always does that. GarryB wrote: The mathematical model to calculate RCS, reflection/emission was Russian developed... the US copied it. I have Ufimtsev's book in my little library. His work had NOTHING to do with calculating radar cross section (RCS). At most, Ufimtsev mathematically formalized the behaviors of waves upon contact and exit of surfaces. If his work was CLEARLY about radar cross section (RCS) value, Ufimtsev would have been carted off to one of those secret Soviet cities reserved for the political, military, and scientific elites to work on developing 'stealth' aircrafts. Instead, the Soviets tossed off his work as having no military value and allowed him to publish internationally. GarryB wrote: Before they read is paper on the concept they built small scale models and hoisted them up in front of real radar and tested them... an extremely slow and expensive way of developing stealth aircraft because they didn't know what worked and what did not without testing it. Not just Lockheed, but all the major US aviation powers knew of radar behaviors. The problem was that they had no predictive methods of those behaviors and they had other projects to finance. The major obstacle was the interference issue. They could not reasonably predict when destructive interference or constructive interference would occur. Ufimtsev's work provided that relief. The front of the Su-34 looks like not a cone, as typical on every fighter , but like two bigger radius shape glued together. The air intake has interesting shape as well, compared to the su-35. Seems like designed to hide the turbine blades. I can't found any fighter apart from the SR-71 and the f-22/35 that looks similarly like the su-34. The logical reason why they chose this complicated front geometry is to decrease the forward looking radar reflector surfaces. Ufimtsev himself admitted that he had no idea Lockheed would use his math THAT WAY. I understand that people in this forum either seeks to diminish US accomplishment or ride the coattails of the same, but the reality is that absolutely %100 of the credit for the development of low radar observability platforms belongs to the US.